At Christmas time you just can't beat a family trip to the panto to get you in the festive spirit. This year we were invited along to see Blue Genie's production of Aladdin at Whitley Bay playhouse, starting Shane Lynch from Boyzone. It really is a show not to be missed. Located close to Whitley Bay town centre and beach front the modern theatre is the perfect venue for a family pantomime, with lots of free on site parking and local transport close by. With a well-priced bar selling a range of drinks and snacks and stalls selling flashing wands for little ones that won't break the bank (we paid £6 for a fairy one) you won't mind buying a few little treats to enjoy the show with. Once again Blue Genie Entertainment return to the Playhouse to produce their eighth pantomime. Headlining act Shane Lynch from Boyzone kicks off the panto as evil Abanazer and while he delivered his lines well he was just a bit too likeable to be a convincing villain. Local celebrity Steve Walls stars as Wishee Washee and he kept the audience entertained throughout with jokes and one-liners the whole family will enjoy, he is a fantastic addition to the show. We visited with our fourteen and three-year-old daughters and they both thoroughly enjoyed this show and laughed and looked on in amazement throughout. 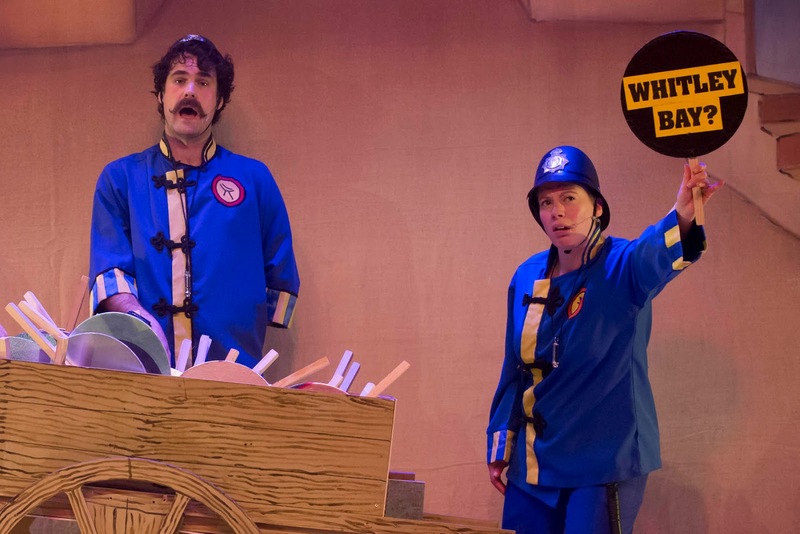 Pc Left and Pc Right brought good old fashioned slapstick humour to the show that had the younger members of the audience laughing out loud. Widow Twanky played by Paul Harris give a brilliant performance as the Panto dame, especially considering he only had six hours rehearsal time due to the previous dame having to pull out at the last minute. Aladdin (Sam Ebenezer) and Jasmine (Charlotte Chinn) both give faultless performances and the slave of the ring (Natasha Boyd) was very energetic. But for us, the star of the show was without a doubt The Geordie of the Lamp, played by local actress Georgia Nicholson she was so likeable and funny, everyone in the audience warmed to her. She truly is a star in the making. All the current little additions to the show kept the audience entertained, such as the mannequin challenge, Pokemon Go and So money supermarket dancing to name just a few. The audience was also amused and delighted with all the regional references to the show too, all the Metro station being named had the audience erupting in laughter. There were a few slip-ups as can be expected but the cast did a truly fantastic job at overcoming them and keeping the show going. The whole audience was amazed at the flying carpet scene, which was magical to watch and the energetic songs and dancing worked well to keep things running smoothly from one scene to the next. My only slight criticism would be that some of the dance scenes seemed to go on a bit too long and some of the songs were a bit irrelevant and everyone's favourite Aladdin song 'a whole new world' was missing. The Ghostbusters scene almost made up for it though as the whole audience was clapping along and getting involved with some good old fashioned "He's behind you" shouting out loud. Before we knew it the show was coming to a close and what better way to end the show than with a medley of Boyzone songs, it just had to be done when you have a member of the band in the show. It was the perfect ending to the show. From start to finish the cast had us laughing and kept us entertained and we thoroughly enjoyed ourselves. 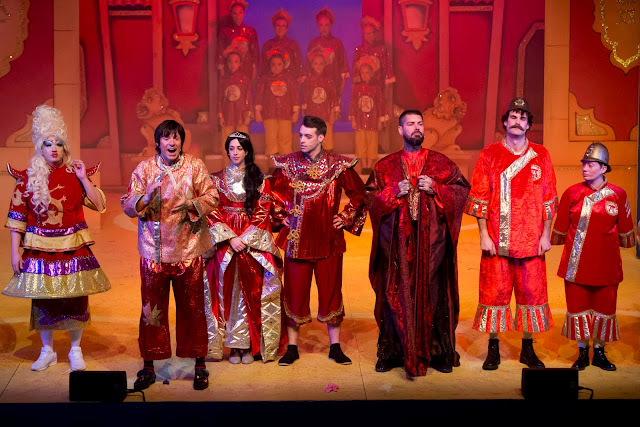 If you live in the North East and are thinking of going to a Panto this year then I highly recommend going to see Aladdin at Whitley Bay Playhouse, it truly is a brilliant panto that the whole family will enjoy. We enjoyed it so much that we will definitely be booking to return to see next year's production of Cinderella, also starring Steve Walls. Aladdin is showing at Whitley Bay Playhouse until Monday 2nd January 2017, tickets start at just £14 per person and can be booked via the Playhouse website ,but hurry as tickets are selling out fast. Disclosure we were provided with complimentary tickets for the purpose of this review. Sounds like a great time was had by all. I haven't been to see Aladdin in years at the theater! Looks and sounds like a great Pantomime, especially the flying carpet! I love a good Pantomime to get you into the Christmas spirit! 'Oh no it didn't!' - sorry couldn't resist that! This is a great write up of what looks like a fab show. Glad you enjoyed it. Sounds like a fantastic panto. I haven't been for years. Oh that sounds like so much fun! We have yet to take our youngest three to see a pantomime but I'm sure we will next year. The sounds like so much fun! I haven't taken the kids to a pantomime yet, but I really want to! Last panto I went to see was when Ant & Dec were in one at the Sunderland Empire in 1998 which I guess is going back a bit! Would you believe I've never been to a panto?! I need to remedy this as they look like loads of fun! This must have been a fab show. I bet it was fun. Looks like an interesting show. I have never seen anything like it before. Looks like a fantastic show! I haven't seen Aladdin on a stage. I didn't go to pantos as a kid (awwww) so it's only through my own children that I've discovered them! They're great fun and an amazing experiences for the wee ones. Glad you had a good time at this one!